Marvel Super Heroes is the Spiritual Successor of X-Men: Children of the Atom. It was released in 1995. 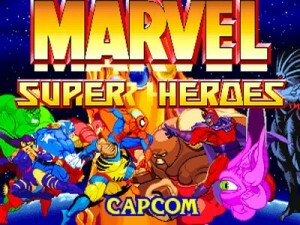 The roster retained Wolverine, Psylocke, Juggernaut, and Magneto, from the previous game, and was diversified with the additions of Captain America, Spider-Man, Iron Man, the Incredible Hulk, Blackheart, and Shuma-Gorath (a Doctor Strange/Kull the Conqueror villain more people know about from these games than the comics). A secret character from Capcom's own character library, Anita (the little girl that accompanied Donovan in Night Warriors who fights on her own right here), is also present and continued the tradition set by Akuma in X-Men: Children of the Atom. The game was based (loosely) on the miniseries The Infinity Gauntlet, and featured the Gems as power-ups that could be gained and used in battle. Each Gem had a different default ability, while each character had an affinity for a certain gem that would make them even stronger when they used it. After fighting the other heroes and villains for the Gems, the player faced down Doctor Doom, before trying to get the final gem from Thanos. It was followed in 1996 with X-Men vs. Street Fighter. In 2012, it was re-released to PlayStation Network and Xbox Live Arcade with Marvel vs. Capcom in Marvel vs. Capcom Origins. The concept of the Infinity Gems as a gameplay mechanic would later be revisited with 2017's Marvel vs. Capcom: Infinite. Not to be confused with Marvel Super Heroes: War of the Gems, another Capcom-developed tie-in to The Infinity Gauntlet released in 1996. A God Am I: Shuma-Gorath's and Dr. Doom's endings in Marvel Super Heroes involves them taking the control of the universe. Also happens in Thanos' ending if the player chooses the first option. Aluminum Christmas Trees: It might be hard to swallow Thanos' second ending where he gives up the power of the Infinity Gauntlet and becomes a simple farmer, but it did indeed happen in the comic storyline too. Adaptation Distillation: Only half of the playable characters (Captain America, Hulk, Wolverine, Spider-Man and Iron Man) and Doctor Doom were featured in the original story (still only a small fraction of the hero cast that was sent to throw down with Thanos), aside from the Mad Titan himself. Plus, rather than Thanos possessing all Infinity Gems at once, they (save for the Mind Gem, which is always with him) are scattered throughout the 8-stage ladder. Ambidextrous Sprite: The Infinity Gauntlet switches hands whenever Thanos faces the other direction, as does Captain America's shield. Animesque: Psylocke's sprites clearly look like the work of Japanese artists, much more than any of the other characters. Badass Arm-Fold: Doctor Doom has this as his Idle Animation. While it looks cool, it's not exactly the most practical position to have your arms in while fighting. Of course, it's Doom we're talking about. Magneto likes to snicker while doing this. Juggernaut, Blackheart and Shuma-Gorath also do this a lot. Badass Normal: Captain America and Iron Man. They uses a shield and Powered Armor respectively, anyway. BFG: Iron Man's PROTON CANNON! BFS: Anita's floating sword is bigger than her, however, but she seems to be able to control it with telekinesis. Calling Your Attacks: A fighting game, so not surprising. Capcom had even more fun with this trope than they did in X-Men: Children of the Atom. The Cameo: Many characters appear in the endings and on the stages. Thornote actually Thunderstrike when he filled in for the Odinson, as in the comics - note the built-in mask on the helmet, She-Hulk, Scarlet Witch, Nova, and Drax the Destroyer appear on Thanos' stage as statues and are broken free in the heroes' endings. Mephisto and Lady Death can also be seen, naturally not turned to statue. Also Adam Warlock in Juggernaut's ending and Cyclops in Wolverine's ending (as well as the other X-Men who were not brought over from Children of the Atom, plus Jean Grey, in Psylocke's ending). For Thor, She-Hulk, and Nova it also counts as an Early Bird Cameo of sorts. There is also a Cameo of Akuma, of all people, during Anita's Flaming Sword special, aptly named "Akuma's Burn", and also a Cameo of Mei-Ling, Hsien Ko's sister from Darkstalker's Revenge, during her Lightning Sword special move. Thor is also seen in Captain America's ending, talking to him. Clothing Damage: Happens to Captain America and Wolverine when both are hit with an Infinity Move as a finisher and on their last round. Combat Tentacles: The only plausible explanation as to how Shuma-Gorath made the cut over Doctor Strange. Combo Platter Powers: How the Reality Gem works. The usual effect gives the user Fire, Ice, Lightning, Blackheart additionally becomes invisible, and Thanos's Super Move for it summons The Walls Are Closing In. Cool Boat: Doctor Doom's stage is a submarine slowly rising up to the surface. Counter Attack: The Infinity Counters are the first proper use of this mechanic in this series; they allow an instant counterattack after blocking at the cost of meter. Activating Infinity Gems can also be used as this. Blackheart's Armageddon summons a meteor storm to the battlefield. The Hulk jumps into space, and essentially pulls a passing meteor from space to drop it on his opponent. Did You Just Punch Out Cthulhu? : Almost literally, with Shuma-Gorath. The maximum level you can have stocked in the Mana Meter is character dependent. Spider-Man for example can hold up to 3 gauges. Shuma-Gorath and Blackheart can only hold 1. As mentioned above, the Infinity Gems double as being alternative Counter Attack moves. Every game after this one only has standard counters and no alternative mechanics. The only Capcom-developed Marvel vs. Capcom game where each character (except Anita) has a unique theme for winning a match, akin to the Darkstalkers games. Although the Taunt Button was added in a proper form, to perform taunts you have to input down twice before pressing taunt. Many of the characters are...different from what they'd be known for in the sequels. For example Magneto's famous air dash is exclusive to his flight mode and Magnetic Tempest is totally different, Captain America and Spider-Man only have one super, Hulk is much faster but doesn't have any armor on any move and has a completely different projectile attack, and Shuma-Gorath's Mystic Stare is a standard projectile instead of triggering a delayed explosion. Most character's staple playstyles in this series would not be established until their respective next playable appearance. Shuma-Gorath's stage additionally has breakable walls that can make it so the stage scrolls infinitely upon being broken. It is the only stage in the game with a gimmick and all games released after this one were completely free of anything that can somewhat drastically alter gameplay. Elephants' Graveyard: Shuma-Gorath's pre-historic stage features several massive skulls and bones, one of which appearing to be a Triceratops. Fire, Ice, Lightning: Blackheart uses all three of these, although fire by far the most and ice not much at all. Flaming Sword: Anita has a special where she sets her sword on fire, and slashes her opponent with it, complete with a Cameo of Akuma!. Fitting enough, this move is called "Akuma's Burn". Fragile Speedster: Wolverine and Psylocke are very fast, with good combos to balance the field. Gameplay and Story Integration: In a way. If Thanos does not have a particular Infinity Gem in his possession during the final battle, the AI will not use the Hyper Combo associated with it. This restriction does not apply to him under player control. Glass Cannon: Blackheart is surprisingly fast and strong for a demon of his size, but he's actually pretty weak defensively. Spider-Man's health is also very low but he's more than fast and powerful enough to get the job done. Genius Bruiser: The Hulk, where he's in the guise of the Merged Hulk/Professor persona. (remember, The Green Scar from Planet Hulk and World War Hulk had yet to be created at the time) There's also Spider-Man and Iron Man, as well. Guest Fighter: Anita, the Creepy Child that follows Donovan, as a Secret Character. note Only in the japanese version of the Playstation port. HeelFace Turn: Magneto has a case of this, in a sense, assuming his dialogue with Thanos is any indication. Immune to Flinching: Juggernaut retains his Super Armor attribute, though it's not as pronounced as it was in 'X-Men:COTA'. Using the Space Gem will bump it back up to something comparable to its previous level, though. Jack-of-All-Stats: Captain America and Iron Man are the best balance in regards of speed, defense and offense. Life Drain: Used by Shuma-Gorath in one of his normal throws. Also by Thanos in his Soul Gem infinity combo. Iron Man using the Soul Gem also qualifies. Little Miss Badass: Anita is a little girl who can bring destruction to whoever underestimates her. MacGuffin Delivery Service: Thanos steals all five Infinity Gems you have picked up throughout the game before the final battle begins. Mighty Glacier: Hulk's attacks are very powerful and much faster in this game than his other appearances in the Capcom fighting games, but he still moves slowly. Juggernaut also qualifies, he moves slowly (unless using his Hyper Combo "Juggernaut Headcrush" attack) and some of his attacks have long recovery time. Monumental Damage: Captain America's stage is in front of a ruined Statue of Liberty. Mythology Gag: Spider-Man takes a jab at the notorious Clone Saga after winning a Mirror Match. Most of Thanos' elements, such as winquotes and the like, are outright taken from famous comic panels such as one of his super move images being taken from the iconic cover of Issue #1 of the Infinity Gauntlet storyline. His "I want more power!" ending image is taken straight from the comic issue where Thanos becomes the new Eternity. Even his "renounce the power" ending happened in the comics storyline. Following from the first ending where Thanos took supreme power, it turned out that as the new Eternity he had no control over his physical form and thus no control over the Infinity Gauntlet, meaning all of his deeds were undone. Thanos attempts to destroy himself with a nuke but Thor knocks him away and Thanos survives and retreats. With that said and done, Adam Warlock, now in possession of the Gauntlet, ventures to a distant planet and indeed finds Thanos there having turned his old costume into a scarecrow and become a simple farmer. Said 2nd ending in game has farmer Thanos and features his scarecrow in the background as well. Juggernaut's ending at one point shows an image of a triumphant Adam Warlock wearing the Infinity Gauntlet, said image being directly inspired by the front cover of issue #1 of Warlock and the Infinity Watch. No Man Should Have This Power: The heroes' ending all have them dumping the power of the Gauntlet, using this trope as justification. It scares Iron Man terribly when he realizes he actually used the power unwittingly to fix his broken body, but Cap reassures him that he's only human, just take it as a second chance at life. Non-Standard Character Design: Anita, who appears with her Darkstalkers sprite, vastly contrasting with the other characters' design. Powered Armor: Iron Man, natch. The Power Gem increases the damage done by the user's attacks. When using this gem, Spider-Man creates a mirror duplicate of himself that can attack his opponent from the other side, Psylocke creates two clones that can block attacks and copy her movements, Captain America's specials are extended similar to the Hyper Combos he would later gain in future games, and Wolverine's speed increases with afterimages trailing him and adding more hits to his attacks similar to his future Berserker Charge Hyper Combo. The Space Gem increases a character's defense. Users who have an affinity for this gem include Magneto and Juggernaut, the two former boss characters from Children Of The Atom who become invincible under the gem's effects. The Soul Gem causes the user's health to slowly regenerate while the gem is active. Iron Man is the sole hero who has affinity with this gem; each of his attacks gains an electrical effect that siphons both the opponent's health and super meter. The Reality Gem causes all normal attacks to emit elemental projectiles. Under this Gem, Blackheart becomes invisible. The Time Gem increases a character's speed. Special users include the Hulk, who can rapid fire any of his normal attacks, and Shuma-Gorath, who can repeatedly petrify his opponent with any attack. The Mind Gem causes the user's super meter to regenerate over time. No character in the game gains any unique buffs with this gem, and it can only be acquired in the Arcade ladder during the battle against Thanos. Promoted to Playable: Juggernaut and Magneto, who were the bosses in X-Men: Children of the Atom, are playable from the start here. However, their SNK Boss status was fully revoked in order to balance them, although it does come back if either of them use the Space Gem. Shock and Awe: Anita's Lightning Sword special: she charges her sword with electricity, and hits her opponent in quick succession. Shotoclone: Spider-Man and Captain America. The Smurfette Principle: Psylocke, and Anita as a Secret Character. Space Base: Magneto's stage, Asteroid M.
Spam Attack: Anita's Infinity Combo, called "Love For You", where she throws lots and lots of doll heads in rapid succession for massive damage. Stripperific: In the ladies' side, Psylocke. In the men's side, Hulk. Surprisingly Good English: All the characters are voiced by native English speakers. Cal Dodd and Rick Bennett reprise their roles from the X-Men cartoon as Wolverine and Juggernaut. Sword Plant: Anita does this with her floating sword, she first places it on the ground, and throws it by pointing her finger at her opponent. Take It to the Bridge: Wolverine's stage, which takes place on a wooden bridge over a river. Slam your opponent down on the deck enough times and the bridge will break and plummet into the river itself. If this happens, after the final round, the winning character will hop off as the bridge goes over a waterfall with the unfortunate loser still KO'd on the bridge. Taunt Button: First game in the series with taunts being very very easy to use and universal. Use Your Head: Juggernaut's Hyper Combo is the "Juggernaut Headcrush" where he lowers his head and charges headfirst across the screen. It's hugely damaging, but easy to jump over if you anticipate it. The Worf Barrage: In a sense. In the final battle, Thanos has all six of the Infinity Gems at his disposal. Against other enemies, all you need to do to make someone drop whichever one they have equipped is to hit them with a special move. Not Thanos, no. For him, you'll need to use a Hyper Combo. Updated Re-release: Received one with the original Marvel Vs. Capcom in Marvel Vs. Capcom Origins. It includes HD graphics, a store to unlock features (illustrations, cheats, etc.) and online play and is also the first time that Anita is available overseas since she's unlockable via the store too.